MACS J1206.2-0847 (or MACS 1206 for short) is a galaxy cluster located about 4.5 billion light-years away in the constellation Corvus. The cluster has thousands of galaxies in it, and a total mass of something like a quadrillion (1,000,000,000,000,000!!) times the mass of our Sun. Galaxy clusters like MACS 1206 are perfect laboratories for studying dark matter’s gravitational effects because they are the most massive structures in the universe. Because of their heft, the clusters act like giant cosmic lenses, magnifying, distorting and bending any light that passes through them — an effect known as gravitational lensing. This cluster is a target in a survey that will allow astronomers to construct the most detailed dark matter maps of more galaxy clusters than ever before. These maps are being used to test previous results that suggest that dark matter is more densely packed inside clusters than some models predict. This might mean that galaxy cluster assembly began earlier than commonly thought. 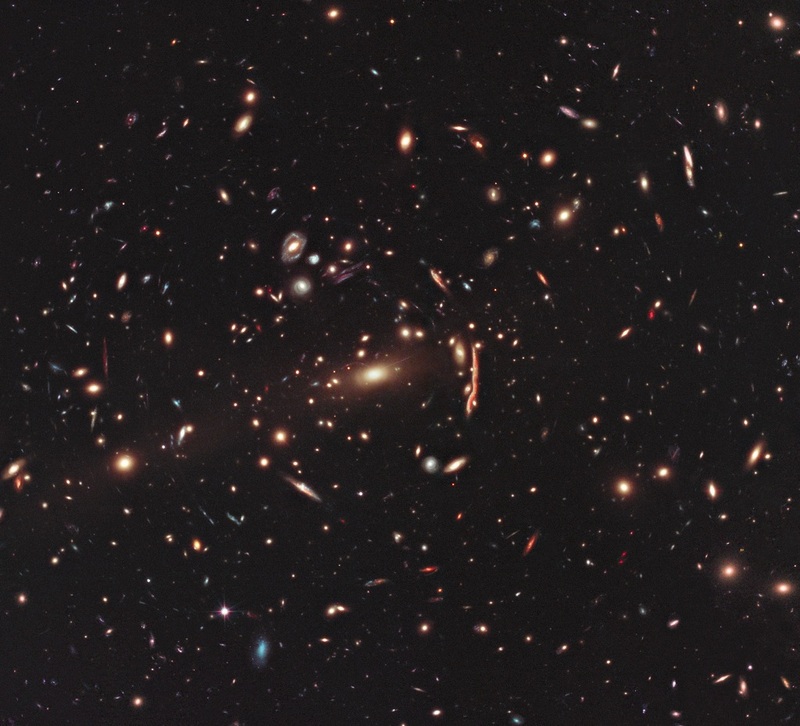 MACS 1206 is one of 25 galaxy clusters being studied as part of the CLASH (Cluster Lensing and Supernova survey with Hubble) programme, a major project to build a library of scientific data on lensing clusters. One of the most important tasks of this multi-wavelength survey is studying the distribution of dark matter in these clusters. Dark matter makes up the bulk of the universe’s mass, yet it can only be detected by measuring how its gravity tugs on visible matter and warps space like a fun-house mirror so that the light from distant objects is distorted. Astronomers uncovered 47 multiple images of 12 newly identified faraway galaxies. Finding so many multiple images in a cluster is a unique capability of Hubble, and the CLASH survey is optimized to find them. The new observations build on earlier work by Hubble and ground-based telescopes. Lensing clusters are useful tools for studying very distant objects, because this lens-like behaviour amplifies the light from faraway galaxies in the background. They also contribute to the precise nature of the lensed images because they encapsulate information about the properties of spacetime and the expansion of the cosmos. This image is taken by the Hubble Space Telescope. N11B emission nebula is an active star-forming region of some 100 light-years across, located about 160,000 light-years away in the upper right part of our neighbouring galaxy, the Large Megallanic Cloud (LMC) in the constellation of Dorado. It is a subregion within a larger area of star formation called N11, which spans over 1000 light-years and is the second largest star-forming region in the LMC. It is only surpassed in the size and activity by the Tarantula nebula (or 30 Doradus), located at the opposite side of the LMC. 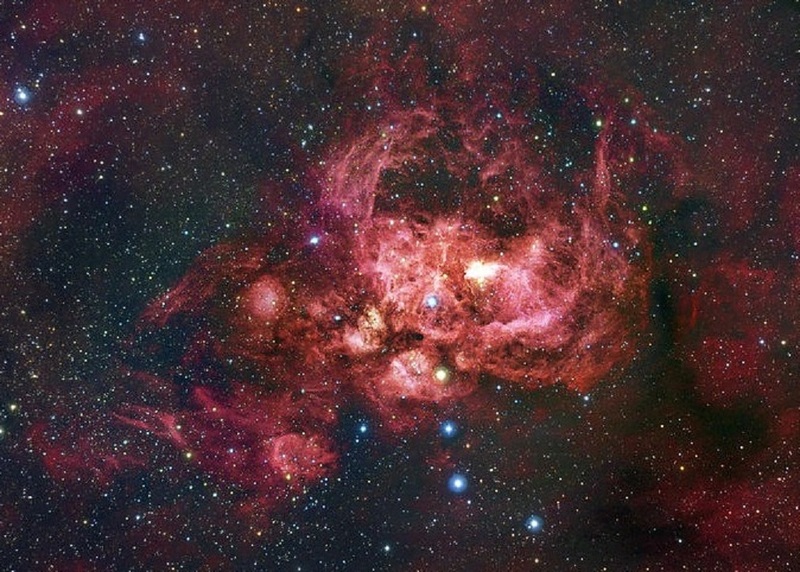 The region around the hot stars on the left of this image is relatively clear of gas, because the stellar winds and radiation from the stars have pushed the gas away. When this gas collides with and compresses surrounding dense clouds, the clouds can collapse under their own gravity and start to form new stars. Farther to the right of the image, along the top edge, are several smaller dark clouds, or globules, of interstellar dust. They are seen silhouetted against the glowing interstellar gas. Several of these dark globules are bright-rimmed because they are illuminated and are being evaporated by radiation from neighbouring hot stars. New stars are now being born inside these globules. N11B has been found to house three successive generations of star formation, so-called sequential star formation – where new star birth is being triggered by previous-generation massive stars. The sequence begins with a cluster of stars outside the top of this image. These stars have carved a large superbubble, leading to the birth of the cluster of blue- and white stars near the left of the image, which are among the most massive stars known anywhere in the Universe. These in turn give birth to new baby stars inside the dark globules. This image was taken with Hubble’s Wide Field Planetary Camera 2 in 1999. 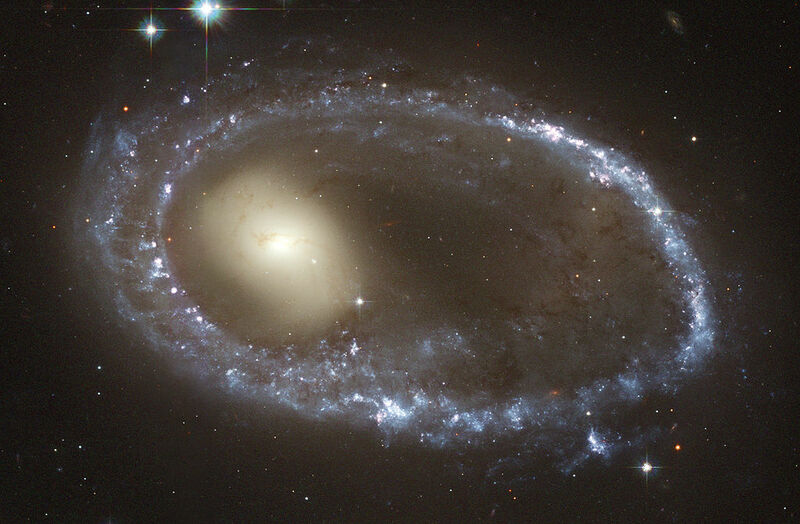 AM 0644-741 (sometimes called The Southern Ellipse) is a ring galaxy, approximately 300 million light-years away in the direction of the southern constellation Volans. It is receding from us at about 6600 km/sec. The yellowish off-center nucleus was once the center of a normal spiral galaxy and the overlapping/double ring of brilliant blue star clusters, which currently surrounds the center, is some 150,000 light-year in diameter, making it larger than our Milky Way Galaxy. Ring galaxies are formed when an intruder galaxy plunges directly through the disk of a target galaxy. In the case of AM 0644-741, the galaxy that pierced through the ring galaxy is out of the image but visible in larger-field images. The collision creates a shock wave that causes the gas and dust to rush outward, somewhat like ripples in a pond after a large rock has been thrown in. As the shock ring plows outward, gas and dust clouds collide, are compressed and then collapse gravitationally to form an abundance of new stars in a ring around the outside. The rampant star formation explains why the ring is so blue: it is continuously forming massive, young, hot stars, which are blue in color. Another sign of robust star formation is the pink regions along the ring. These are rarefied clouds of glowing hydrogen gas that is fluorescing as it is bombarded with strong ultraviolet light from the blue stars. Minkowski’s Footprint [designated Minkowski 92 (M1-92) and IRAS 19343+2926] is a bipolar protoplanetary nebula, about 8000 light-years away in the constellation Cygnus, that features two vast onion-shaped structures on either side of a central ageing star. Protoplanetary nebulae like Minkowski’s Footprint have short lives, being a preliminary stage to the more common planetary nebula phase. The centrtal star, soon to be a white dwarf, is puffing out material due to intense surface pulsations. Charged particle streams, called stellar winds, are shaping this gas into interesting shapes. Technically speaking Minkowski’s Footprint is currently a reflection nebula as it is only visible due to the light reflected from the central star. In a few thousand years the star will get hotter and its ultraviolet radiation will light up the surrounding gas from within, causing it to glow. At this point it will have become a fully fledged planetary nebula. The processes behind protoplanetary nebulae are not yet completely understood. Messier 106 (also designated NGC 4258) is a spiral galaxy around 30 thousand light years across, located about 22 to 25 million light-years away in the constellation Canes Venatici. It is receding from Earth at 537 km/sec. Most likely Messier 106 has a companion, namely the barred spiral galaxy NGC 4217. It is one of the closest examples of a Seyfert II galaxy, where vast amounts of glowing gas are falling into a central supermassive black hole. A supernova (1981K) occurred in M106 in August 1981. Along with a bright central core, this composite image highlights youthful blue star clusters and reddish stellar nurseries which are tracing the galaxy’s spiral arms, as well as dark dust lanes that form a spiral pattern which can be traced well into the central region to the core. It also shows off remarkable reddish jets of glowing hydrogen gas. The star clusters are dominated by very hot, bright and massive stars what indicates that these clusters cannot be very old, as such massive stars have only a short lifetime of a few million years. So they show us regions of very recent star formation! In visible and infrared light, two prominent arms emanate from the bright nucleus and spiral outward. But in radio and X-ray images, two additional spiral arms are seen, the so-called anomalous arms. These ghostly arms represent regions of gas that are being violently heated by shock waves. Previously, some astronomers had suggested that the anomalous arms are jets of particles being ejected by the supermassive black hole in the nucleus of Messier 106. But radio observations later identified another pair of jets originating in the core. However, the jets do heat the gas in their line of travel, forming an expanding cocoon. Because the jets lie close to M106’s disk, the cocoon generates shock waves and heat the gas in the disk to millions of degrees, causing it to radiate brightly in X-rays and other wavelengths. In addition to M106’s small companion galaxy NGC 4248 (bottom right), background galaxies as well as foreground stars can be found scattered throughout this image. The Eskimo Nebula (NGC 2392, and sometimes also called Clownface Nebula) is a bipolar double-shell planetary nebula over 68 light-years in diameter, located more than 2,870 light-years away in the constellation Gemini. Planetary nebulae are not related to planets at all. When a star with a mass similar to that of our own Sun nears the end of its lifetime, it expands in size to become a red giant. The red-giant stage ends when the star expels its outer layers into space, producing a glowing nebula. Astronomers call such an object a planetary nebula, because its round shape resembles that of a planet when viewed with a small telescope. Planetary nebulae fade gradually over tens of thousands of years. The hot, remnant stellar core will eventually cool off for billions of years as a white dwarf. Our own Sun will undergo a similar process, so, planetary nebulae could well offer a glimpse of the future that awaits our own Sun in about five billion years. The Eskimo Nebula’s shape is created by a ring of dense material around a dying star’s equator, ejected during its red giant phase. When viewed through ground-based telescopes, it resembles a face surrounded by a fur parka hood, but from space the nebula displays complex gas clouds composed of the outer layers of a Sun-like star only 10,000 years ago. The “parka hood” is a broad disk of material with unusual light-year long, orange, comet-shaped objects, with their tails streaming away from the central dying star, possibly formed from a collision of slow-and fast-moving gases. The Eskimo’s “face” also contains some fascinating details like bubbles of matter and filaments, blown into space by the central star’s strong “wind” of high-speed particles. One bubble lies in front of the other, obscuring part of the second lobe. The bubbles are not smooth like balloons but have filaments of denser matter. 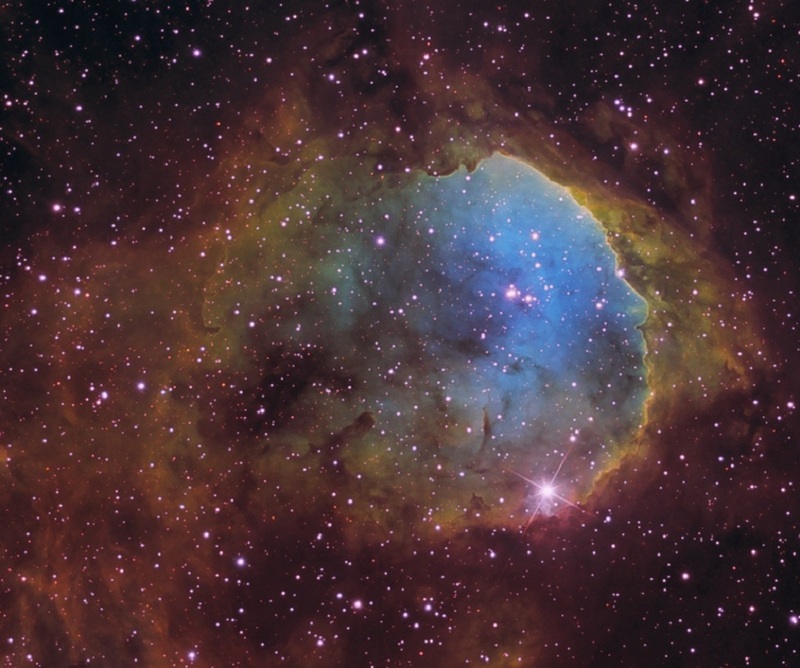 Each bubble is about 1 light-year long and about half a light-year wide. ESO 69-6 (also known as ESO 069-IG006 and AM 1633-682) consists of two interacting galaxies about 650 million light-years away in the constellation of Triangulum Australe. The two galaxies are moving away from us at a speed of almost 14,000 kilometers per second. The galaxies of this beautiful interacting pair bear some resemblance to musical notes on a stave. Long tidal tails sweep out from the two galaxies: gas and stars were stripped out and torn away from the outer regions of the galaxies. The presence of these tails is the unique signature of an interaction. The Gabriela Mistral Nebula (also known as NGC 3324 and IC 2599) is an emission nebula, an HII region excited by an open star cluster (OCL 819) in its center. It is located about 7,200 light-years away at the northwest corner of the Carina Nebula (NGC 3372) in the southern constellation of Carina. 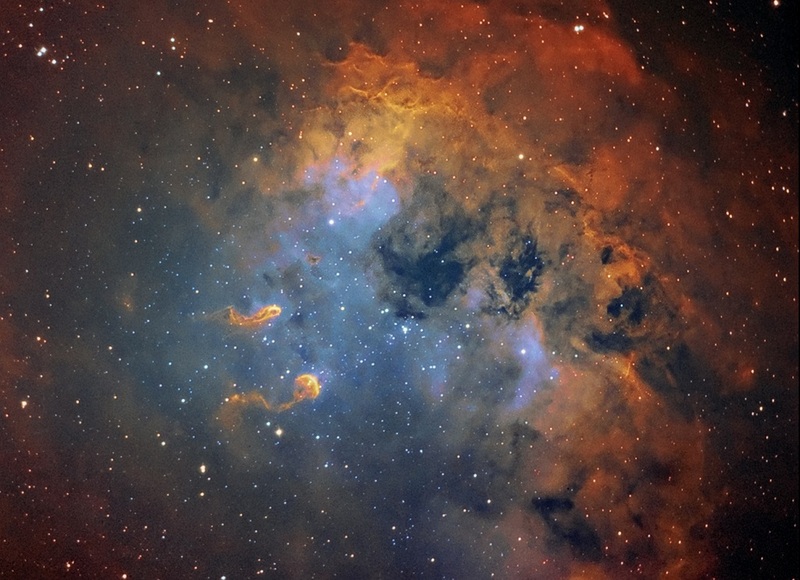 In fact, IC 2599 is the southern part of NGC 3324. A rich deposit of gas and dust in the NGC 3324 region fuelled a burst of starbirth millions of years ago and led to the creation of several extremely massive and very hot stars. The intense ultraviolet radiation from these hot young stars causes the gas cloud to glow and has carved out a cavity in the surrounding gas and dust. In fact the stars are slowly eroding the gas cloud away. The dark patches in the image are regions where veils of dust block out the light from the background glowing gas. Astronomers often attach nicknames to nebulae based on their shape and their earthly likenesses. The edge of the wall of gas and dust at the right bears a strong resemblance to a human face in profile, with the “bump” in the center corresponding to a nose. So, NGC 3324 is often called the Gabriela Mistral nebula, after the Nobel Prize-winning poet from Chile. Mayall’s object (also known as Arp 148) is the stunning result of an encounter between two galaxies resulting in a ring-shaped galaxy and a long-tailed companion, located almost 465 million light-years away within the constellation Ursa Major. The pair extends across 80 thousand light-years. The collision between the two parent galaxies produced a shockwave effect that first drew matter into the center and then caused it to propagate outwards in a ring. The elongated companion perpendicular to the ring suggests that Arp 148 offers a unique view of a collision in progress. What probably has been the core of the “target” galaxy can be seen as a small yellow area at 5 o’clock inside the newly formed ring. Massive star formation dominates the ring. Infrared observations also reveal a strong obscuration region that appears as a dark dust lane across the nucleus in optical light. 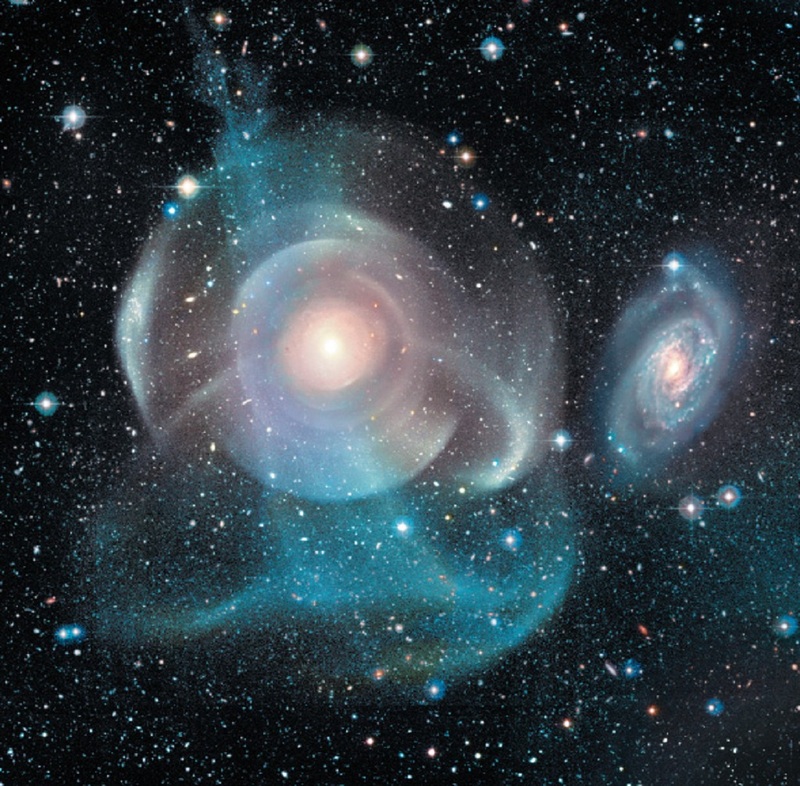 This interacting pair of galaxies is included as number 148 in Arp’s “Atlas of Peculiar Galaxies”, a catalog of 338 peculiar galaxies produced by Halton Arp. This catalog was meant to provide examples of various types of galaxies as a guide for study of the origin and evolution of galaxies, at a time (the mid-1960’s) when astronomers had little idea what that involved. Although the Atlas was intended only as a sampling, rather than an inclusive listing of galaxies, it contains a number of interesting objects which are often referred to by their Arp numbers. Galaxies can and do merge. In the past, collisions were more common when the Universe was smaller and the islands of stars were much closer to each other. While mergers are less frequent today, they still do occur. Right now, our own galaxy, the Milky Way, is consuming the Sagittarius dwarf elliptical galaxy. But in about two billion years the Milky Way and the giant Andromeda Galaxy will collide. In this Hubble image you’ll find a great many of the faint “stars” which are really distant anonymous galaxies. NGC 1333 is a diffuse reflection nebula about 4 light-years across, that is less than a million years old. It is located a mere 1,000 light-years away in the constellation Perseus, at the edge of the Perseus molecular cloud. It is one of the nearest star forming regions and particularly rich in young stars. Stellar clusters are born embedded within molecular clouds and during their early evolution they are often only visible at infrared wavelengths, because they are heavily obscured by dust. The nebula contains hundreds of these young (less than a million years old) stars, most still obscured by the dusty clouds which formed them. With the penetrating infrared view of the Spitzer Space Telescope, scientists can detect light from these objects. This allows a look through the dust to gain a more detailed understanding of how stars like our Sun begin their lives. The young stars in NGC 1333 do not form a single cluster, but are split between two sub-groups. One group is to the northern part of the nebula shown as red in the image. The other group is south, where the features shown in yellow and green abound in the densest part of the natal gas cloud. With the sharp infrared eyes of Spitzer, scientists can detect and characterize the warm and dusty disks of material that surround forming stars. By looking for differences in the disk properties between the two subgroups, they hope to find hints of the star- and planet-formation history of this region. The greenish streaks and splotches located in the lower portion of the image are glowing shock fronts where jets of material, spewed from extremely young embryonic stars, are plowing into the cold, dense gas nearby. The sheer number of separate jets that appear in this region is unprecedented. This leads scientists to believe that by stirring up the cold gas, the jets may contribute to the eventual dispersal of the gas cloud, preventing more stars from forming in NGC 1333. In contrast, the upper portion of the nebula is dominated by the infrared light from warm dust, shown as red. Astronomers have discovered 30 to 40 brown dwarfs in NGC 1333 and Rho Ophiuchi cloud complex together, including one that is just six times the mass of Jupiter, making it one of the smallest free-floating objects known. NGC 1333 is harboring half as many brown dwarfs as normal stars. The brown dwarfs also seem to be more common in NGC 1333 than in other young star clusters. That difference may be hinting at how different environmental conditions affect their formation. It also suggests that objects not much bigger than Jupiter could form the same way as stars do. There are also 36 Herbig-Haro obejects identified in NGC 1333 confirming its status as a young active region of star formation. Herbig-Haro objects are small nebulae produced by outflows ejected by newly born stars, and are formed when narrow jets of gas ejected by young stars collide with clouds of gas and dust nearby at speeds of several hundred kilometres per second. They are usually highly obscured by the clouds of gas and dust from which they formed. 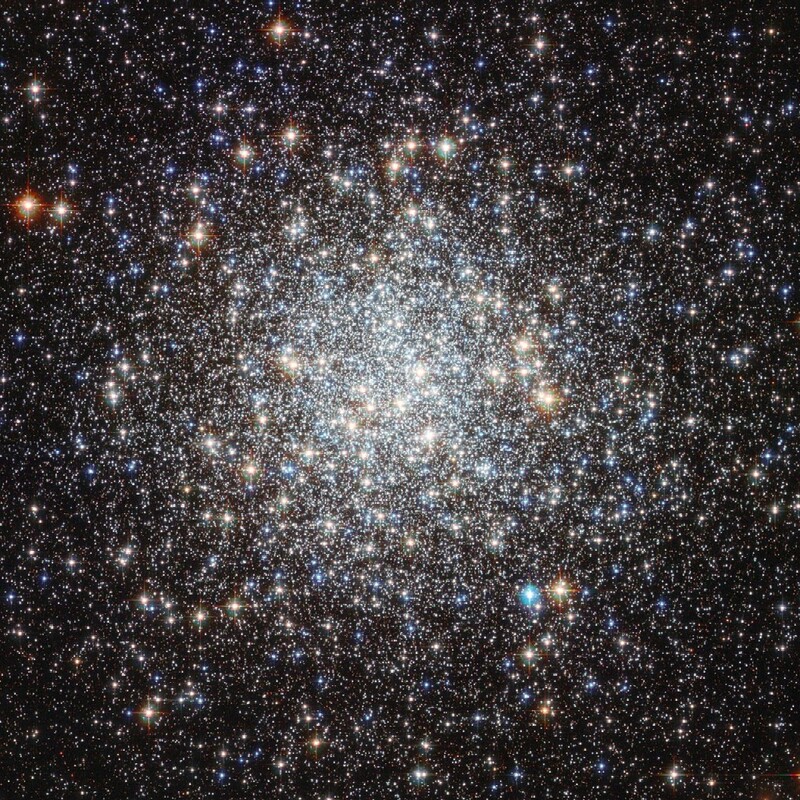 Messier 9 (also known as NGC 6333) is a globular cluster some 90 light-years across, located about 25,800 light-years away in the constellation of Ophiuchus. It is receding from us at the very high velocity of 224 km/sec. Messier 9 is one of the nearer globular clusters to the center of the Milky Way Galaxy, with a distance of around 5,500 light-years — so close that the gravitational forces from the galactic centre pull it slightly out of shape. More than 250,000 are shining in this image of Messier 9, with a total luminosity of around 120,000 times that of the Sun. The brightest individual stars in Messier 9 are also visible in moderately sized telescopes. There have been 13 variables discovered in this cluster. Globular clusters are thought to harbor some of the oldest stars in our galaxy, born when the Universe was just a small fraction of its current age. As well as being far older than our Sun (around twice its age) the stars of Messier 9 also have a markedly different composition, and are enriched with far fewer heavier elements than the Sun. In particular, the elements crucial to life on Earth, like oxygen and carbon, and the iron that makes up our planet’s core, are very scarce in Messier 9 (and clusters like it). This is because the Universe’s heavier elements were gradually formed in the cores of stars, and in supernova explosions. When the stars of Messier 9 formed, there were far smaller quantities of these elements in existence. As well as showing the individual stars, this Hubble image clearly shows the different colors of the stars. A star’s color is directly related to its temperature — counter-intuitively, perhaps, the redder it is, the cooler it is; and the bluer it is, the hotter. The wide range of stellar temperatures here is clearly displayed by the broad palette of colors visible in this image of Messier 9. 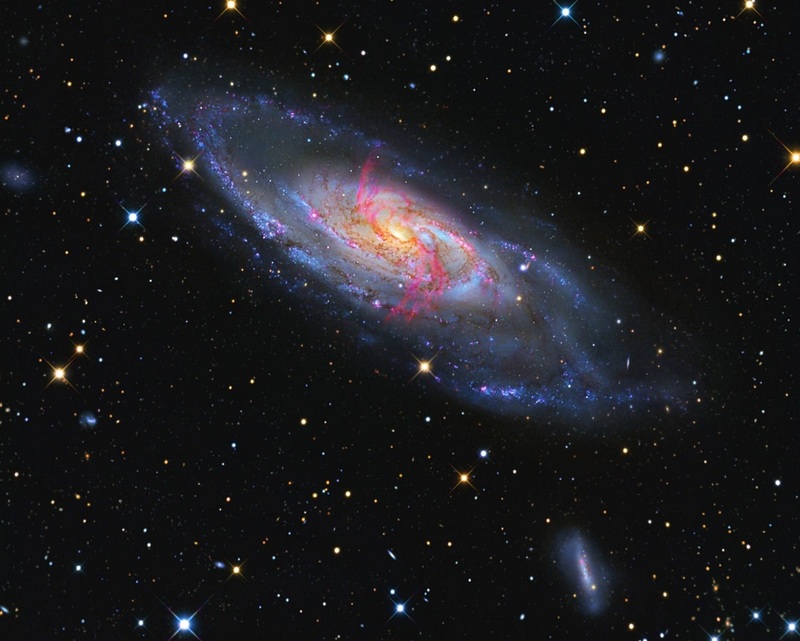 Messier 109 (also known as NGC 3992) is a barred spiral galaxy some 137,000 light years across, with an estimated mass of 250 billion solar masses. It is about 67.5 million light-years away, and running away from us at an approximate speed of 1142 kilometers per second. It is the brightest galaxy in the M109 Group, a large group of galaxies in the constellation Ursa Major where 79 galaxies have been identified. Messier 109 has three satellite galaxies (UGC 6923, UGC 6940 and UGC 6969) and possibly even more. Detailed hydrogen observations have been obtained from M109 and its satellites. M109’s neutral atomic hydrogen (H I) distribution is regular with a low level radial extension outside the stellar disk, while at exactly the region of the bar, there is a central H I hole in the gas distribution. Possibly the gas has been transported inwards by the bar; because of the emptiness of the hole no large accretion events can have happened in the recent past. In March 1956, type Ia supernova 1956A was observed in the southeast part of the galaxy and that is also the only supernova observed in M109 since its discovery. 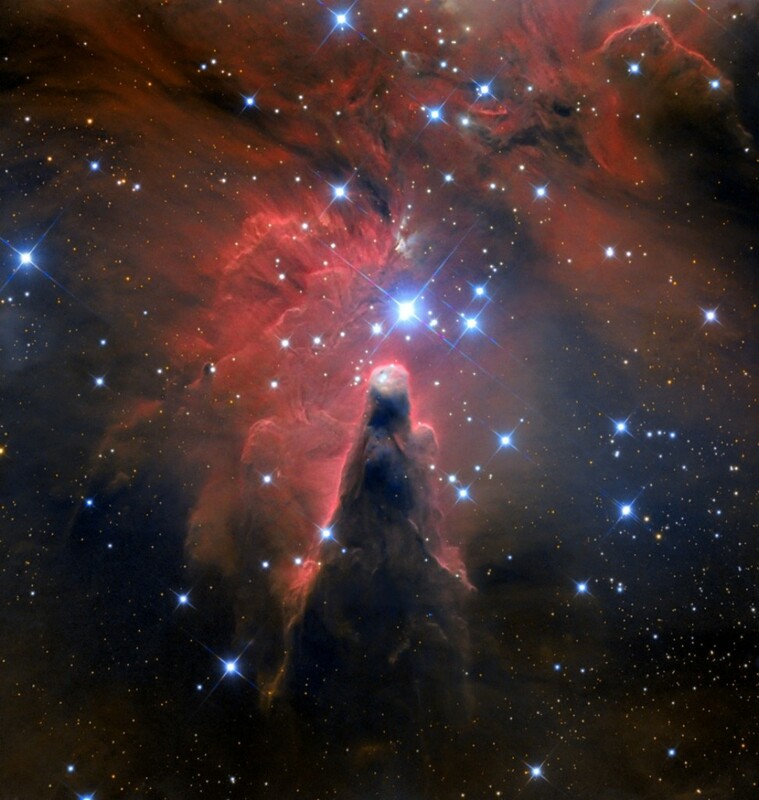 The Cone Nebula is a geomatic, dark, diffuse nebula and H II region of approximately seven light-years long, located about 2,700 light-years away in the Orion Arm of our Milky Way Galaxy, in the constellation Monoceros. The faint nebula, which is part of a much larger turbulent star-forming region, lies in the southern part of NGC 2264, the Christmas Tree Cluster, with which it shares the NGC designation. This pillar of gas and dust got its name because, in ground-based images, it has a conical shape. The shape comes from a dark absorption nebula consisting of cold molecular hydrogen and dust in front of a faint emission nebula containing hydrogen ionized by S Monocerotis, the brightest star of NGC 2264. The dark Cone Nebula region clearly contains much dust which blocks light from the emission nebula and open cluster behind it. One hypothesis holds that the Cone Nebula is formed by wind particles from an energetic source blowing past the Bok Globule (a small dark cloud of gas and dust that are typically condensing to form new stars) at the head of the Cone. Radiation from hot, young stars off the top of the Cone slowly erodes this giant, gaseous pillar over millions of years. Additional ultraviolet radiation causes the gas to glow, giving the pillar its red halo of light. Over time, only the densest regions of the Cone will be left. Inside these regions, stars and planets may form. Pillars of cold gas, like the Cone Nebula (and for instance the Eagle Nebula) are common in large regions of star birth. Astronomers believe that these pillars are incubators for developing stars. 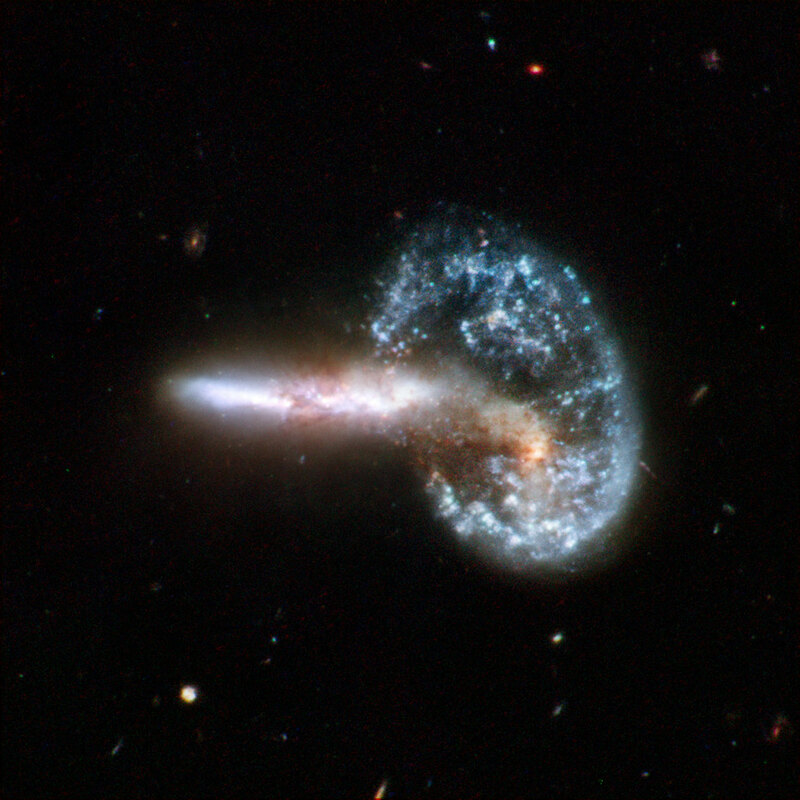 Arp 227 consists of two galaxies in the constellation Pisces: the large (250,000 light-years across) lenticular galaxy NGC 474 (also known as UGC 864) located about 93 million light-years away, and the spiral galaxy NGC 470 at about 95 million light-years away. They lie at a separation of about 160,000 light-years. Astronomers detected two additional members of the group which indicates that the pair constitutes the dominant members of a loose group. Evidence also suggests that Arp 227 is an evolving group in the early phase of its evolution and that its drivers are the accretion of faint galaxies and the ongoing large-scale interaction between NGC 470 and 474. There is a tidal tail of gas and dust that connects NGC 474 to NGC 470, showing that the two are currently undergoing interaction. The low X-ray luminosity of NGC 470 seems to be a characteristic of dynamically young systems. NGC 474 is a classic shell galaxy. These are usually the result of a merger though there’s no evidence of this in this case. All stars in it have a common motion. Normally if there’s a recent merger there are two families of stellar motion evident in the galaxy. That isn’t the case here. The origin of the faint, wide arcs or shells of NGC 474 could have been formed by a gravitational encounter with NGC 470. But if NGC 470 caused the distortions in 474 why isn’t it similarly distorted as its mass appears less it should be even more torn up? This remains unknown. Alternately the shells could be caused by a merger with a smaller galaxy (or galaxies) in the past billion years, producing an effect analogous to ripples across the surface of a pond. This image dramatically highlights the increasing consensus that the outer halos of most large galaxies, including our Milky Way Galaxy, are not really smooth but have complexities induced by frequent interactions with — and accretions of — smaller nearby galaxies. The War and Peace Nebula (also known as NGC 6357 and Sharpless 11) is a large diffuse emission nebula about 400 light-years across where new stars are being born in of chaotic clouds of gas and dust, located about 8,000 light-years away in the constellation Scorpius, near the Cat’s Paw Nebula (NGC 6334). The name was given by astronomers because of its appearance in the mid-infrared: in infrared images the bright, northwestern part resembles a dove, while the eastern part looks like a human skull. Unfortunately this effect cannot be seen in visible-light. NGC 6357 includes the open cluster Pismis 24, which is home to several massive stars. One of the brightest stars in the cluster, Pismis 24-1, was thought possibly to be the most massive on record, approaching 300 solar masses, until it was discovered to be a binary system with each star exceeding 100 solar masses. 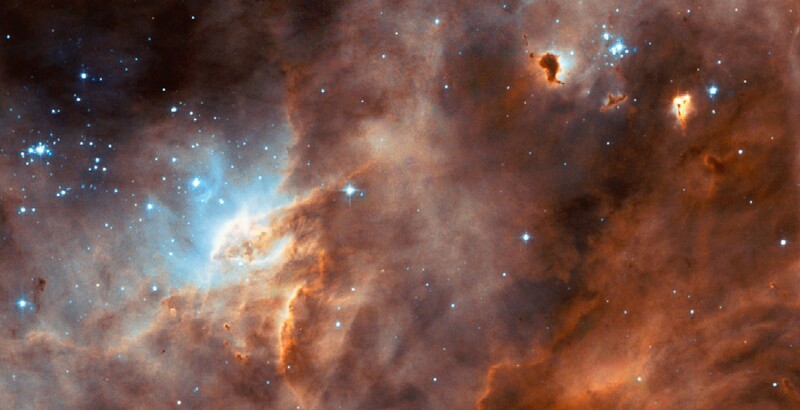 Part of the nebula is ionised by the youngest and bluest heavy stars in Pismis 24. The intense ultraviolet radiation from the blazing stars heats the gas surrounding the cluster and creates a bubble in NGC 6357. The nebula’s bright central region also contains a river of dust, and dusty pillars of molecular gas, likely hiding many massive protostars, and young stars wrapped in expanding “cocoons”. Intricate shapes in the nebula are carved by interstellar winds and energetic radiation from the young and newly forming massive stars. NGC 1365 (also known as the Great Barred Spiral Galaxy) is a supergiant barred spiral galaxy with a diameter of about 200,000 lightyears. It is located about 56 million light-years away in the constellation Fornax, and is a major member of the Fornax Galaxy Cluster which contains 58 galaxies. NGC 1365 is one of the most prominent “barred” galaxies, and also one of the most studied barred spiral galaxies in the sky. It is nicknamed the Great Barred Spiral Galaxy because of its strikingly perfect form, with the massive straight bar and two very prominent outer spiral arms. Closer to the centre there is also a second spiral structure and the whole galaxy is laced with delicate dust lanes. 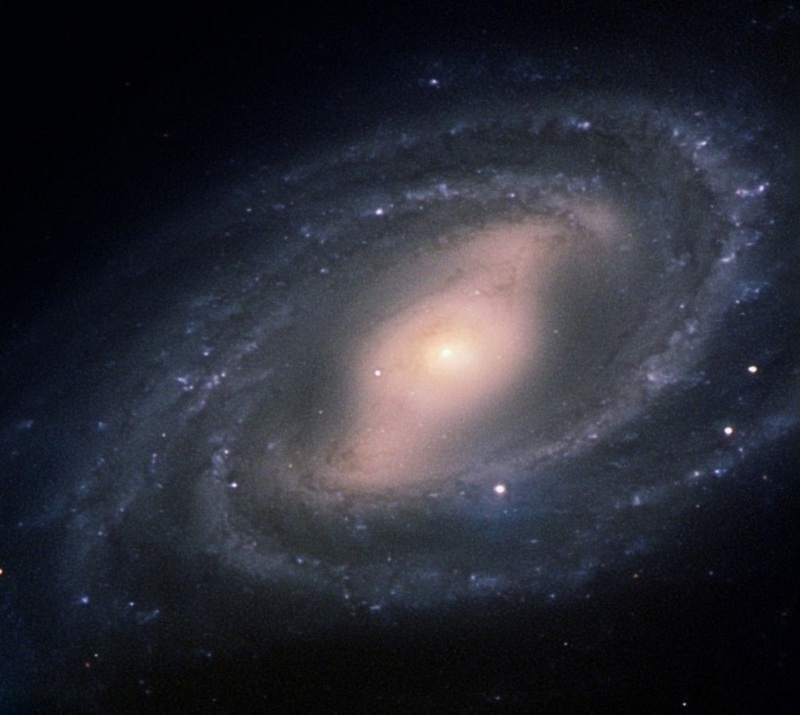 This galaxy is an excellent laboratory for astronomers to study how spiral galaxies form and evolve. Infrared images reveal the glow from vast numbers of stars in both the bar and the spiral arms. The huge bar disturbs the shape of the gravitational field of the galaxy and this leads to regions where gas is compressed and star formation is triggered. Many huge young star clusters trace out the main spiral arms and each contains hundreds or thousands of bright young stars that are less than ten million years old. The galaxy is too remote for single stars to be seen and most of the tiny clumps visible in this image are really star clusters. Over the whole galaxy, stars are forming at a rate of about three times the mass of our Sun per year. While the bar of the galaxy consists mainly of older stars which are giving the bar a reddish colour, many new stars are born in stellar nurseries in the inner spiral close to the nucleus, which is a so-called active galactic nucleus, or AGN. The bar also funnels gas and dust gravitationally into the very centre of the galaxy, where astronomers have found evidence for the presence of a super-massive black hole. The black hole at the center of the AGN is fed by a steady stream of material, presumably in the form of a disk. Material just about to fall into a black hole should be heated to millions of degrees before passing over the event horizon, or point of no return. The process causes the disk of gas around the central black hole in NGC 1365 to produce copious X-rays, making it a bright X-ray source, but the structure is much too small to resolve directly with a telescope. The bar and spiral pattern rotates clockwise, but different parts of the galaxy take different times to make a full rotation around the oval-shaped core of the galaxy, with the outer parts of the bar completing one circuit in about 350 million years. Supernovae 2001du, 1983V, and 1957C were observed in NGC 1365. 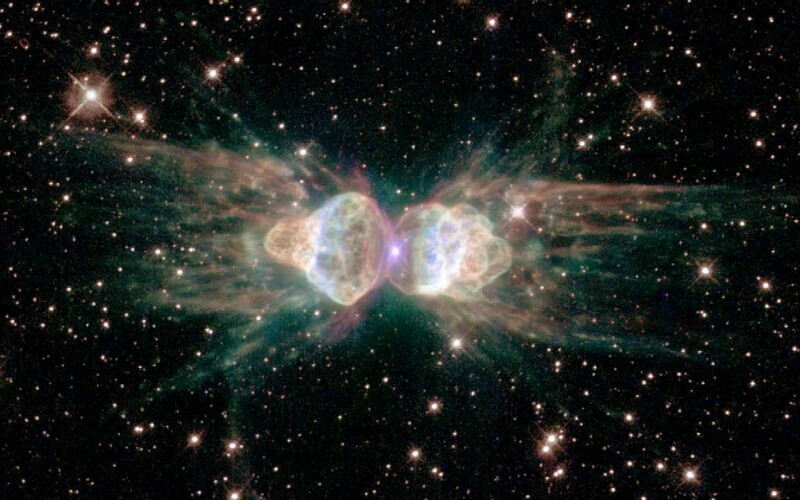 The Ant Nebula (Menzel 3 or Mz 3 for short) is a young bipolar planetary nebula about 2 light-years across, which is radially expanding at a rate of about 50 km/s. It is located some 8000 light-years away in the constellation Norma. The name of the nebula — the glowing remains of a dying, Sun-like star — is given because it resembles the head and thorax of an ant. The nebula has arguably the most complex bipolar morphology, consisting of a bright core, three nested pairs of bipolar lobes and an equatorial ellipse. Its bipolar lobes share the same axis of symmetry but have very different opening angles and morphologies: the innermost pair of bipolar lobes shows closed-lobe morphology, whereas the other two have open lobes with cylindrical and conical shapes, respectively. The expansion characteristics of the two outer pairs of lobes suggest that they originated in an explosive event, whereas the innermost pair of lobes resulted from the interaction of a fast wind with the surrounding material. The equatorial ellipse is associated with a fast equatorial outflow, which is unique among bipolar nebulae. The dynamical ages of the different structures in Mz 3 suggest episodic bipolar ejections, and the distinct morphologies and kinematics among these different structures reveal fundamental changes in the system between these episodic ejections. Though approaching the violence of an explosion, the ejection of gas from the dying star at the center of Mz 3 has intriguing symmetrical patterns unlike the chaotic patterns expected from an ordinary explosion. Why would the gas that is streaming away create an ant-shaped nebula out of a round star? One possibility is that the central star of Mz 3 has a closely orbiting companion that exerts strong gravitational tidal forces, which shape the outflowing gas. For this to work, the orbiting companion star would have to be close to the dying star. So close that the orbiting companion star wouldn’t be far outside the hugely bloated hulk of the dying star. It’s even possible that the dying star has consumed its companion, which now orbits inside of it. A second possibility is that, as the dying star spins, its strong magnetic fields are wound up into complex shapes. Charged winds moving at speeds up to 1000 kilometers per second from the star are able to follow the twisted field lines on their way out into space. These dense winds can be rendered visible by ultraviolet light from the hot central star or from highly supersonic collisions with the ambient gas that excites the material into florescence. The Ant Nebula has no trace of molecular hydrogen emission, which is unusual given the strong correlation between such emissions and bipolar structures of planetary nebulae. Since the central star appears to be so similar to our own Sun, astronomers hope that increased understanding of the history of this giant space ant can provide useful insight into the likely future of our own Sun and Earth. Our Sun’s fate probably will be more interesting, complex, and striking than astronomers imagined just a few years ago. 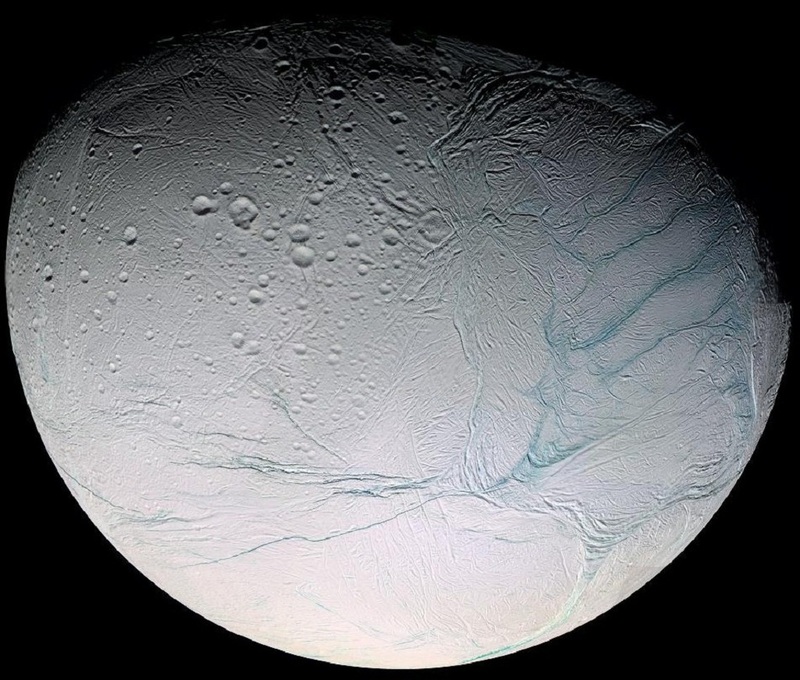 Enceladus is, with a diameter of only 505 km (314 mi), the sixth-largest moon of Saturn. This oblate spheroid has a highly reflective surface devoid of impact craters and reflects almost all of the sunlight that strikes it. Because Enceladus reflects so much sunlight, the surface temperature is only -330 degrees Fahrenheit (-201degrees Celsius). Despite the moon’s small size, it has a wide range of terrains. In addition to cratered areas, Enceladus contains smooth plains, linear cracks and ridges, fissures, and unusual crustal deformations. The smooth plains indicate a very young surface, perhaps only a few hundred million years old. The craters on Enceladus are all smaller than 21 miles (35 km) in diameter. The cracks, ridges, and other unusual features seem to indicate that the interior of the moon may still be liquid. This could be caused by internal heat as a result of tidal forces from Saturn. Enceladus has water ice on its surface and probably sub-surface liquid water. The smooth plains were almost certainly formed by water flowing to the surface from deep inside the moon. Cryovolcanoes at the south pole shoot large jets of water ice particles into space. Some of this water falls back onto the moon as “snow”, some of it adds to Saturn’s rings, and some of it reaches Saturn. Because of this apparent water at or near the surface, Enceladus is emerging as the most habitable spot beyond Earth in the Solar System for life as we know it. Cassini spacecraft discovered water-rich plumes and complex hydrocarbons venting from the moon’s south polar region. The salty composition of these plumes strongly suggests that they originate from a subsurface salty ocean or subsurface caverns filled with salty water. The discovery of the plumes, along with the presence of escaping internal heat, active eruptions and very few (if any) impact craters in the south polar region, shows that Enceladus is geologically active today. Enceladus orbits Saturn at a distance of 238,000 km from the planet’s center, between the orbits of Mimas and Tethys, keeping one face pointed toward Saturn, and requires 32.9 hours to revolve once. It orbits in the densest and narrowest part of Saturn’s diffuse E ring, the widest and outermost of Saturn’s rings. Such a wide ring is unstable, and therefore – combined with the apparent youthful appearance of the surface, and the discovery of the plumes – scientists suggest that the E-ring consists of particles vented from Enceladus’s surface. Enceladus is perturbed in its orbit by Saturn’s gravitational field and by the large neighboring satellites Tethys and Dione. This disturbance is probably responsible for the internal heat of Enceladus. NGC 4214 (also known as NGC 4228 and UGC 7278) is an irregular dwarf starburst galaxy, located only about 10 million light-years away in the constellation Canes Venatici. 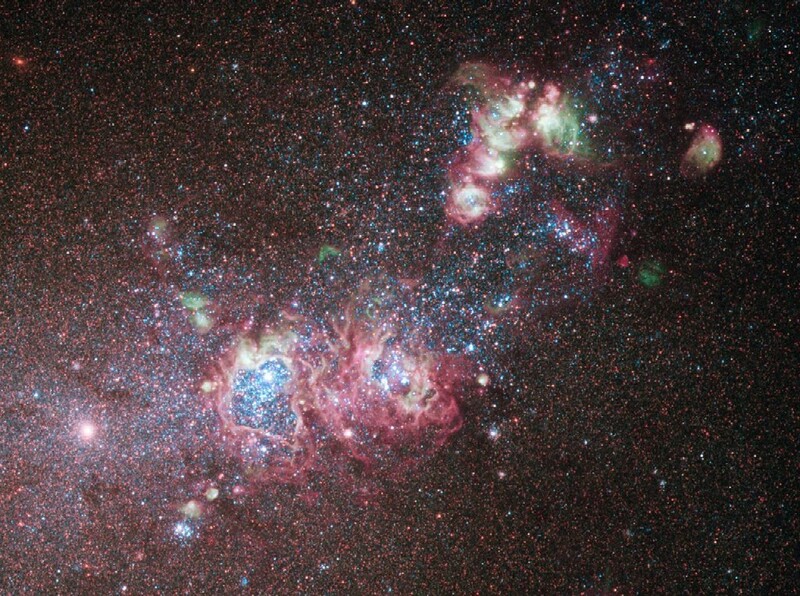 Dwarf galaxy NGC 4214 may be small, but what it lacks in size it makes up for in content. It is packed with everything an astronomer could ask for, like intricate patterns of glowing ionised hydrogen gas; hot, young star-forming regions; old clusters with red supergiants; and cavities blown clear of gas by stellar winds. NGC 4214 contains a large amount of red glowing ionised hydrogen gas, providing abundant material for star formation. The area with the most gas, and consequently, the youngest clusters of stars (around two million years old), lies in the upper part of this Hubble image. Dominating much of the galaxy is a huge cloud of hydrogen gas with a huge heart-shaped cavity at its centre. Inside this cavity lies a large cluster of massive, young stars ranging in temperature from 10,000 to 50,000 degrees Celsius. Their strong stellar winds are responsible for the creation of this bubble. The resulting lack of gas prevents any further star formation from occurring in this region. Observations of NGC 4214 have also revealed clusters of much older red supergiant stars that we see at a late stage in their evolution. Additional older stars can be seen dotted all across the galaxy. While these are dominant in infrared emission they can only be seen shining faintly in this visible-light image. The variety of stars at different stages in their evolution, indicate that the recent and ongoing starburst periods are by no means the first, and the galaxy’s numerous ionised hydrogen regions suggest they will not be the last. The galaxy’s relative close proximity to us, combined with the wide variety of evolutionary stages among the stars, makes it an ideal laboratory to research what triggers star formation and evolution. IC 410 is a faint and dusty emission nebula over 100 light-years across, located in a large HII region about 12,000 light-years away in the northern constellation Auriga. The cloud of glowing gas is sculpted by stellar winds and radiation from the embedded open cluster of massive hot stars catalogued as NGC 1893, which is just about 4 million years old. Notable are two streamers of material, known as the “Tadpoles of IC 410”. These tadpoles, which consist of denser, cooler gas and dust, are approximately 10 light-years long and potentially sites of ongoing star formation. Form given by the winds and radiation of the cluster’s stars, the tadpoles are pointing their tails outwards, away from the nebula’s central regions. 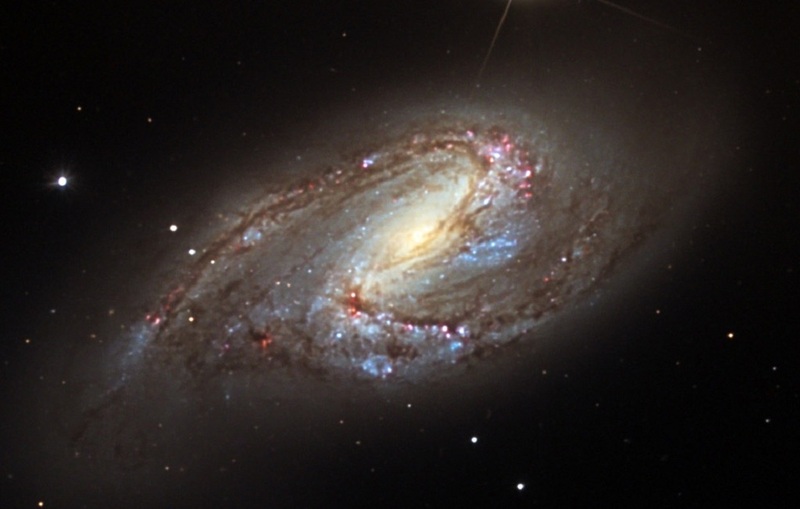 Messier 66 (also known as NGC 3627 and Arp 16) is an intermediate spiral galaxy, some 95,000 light-years across and about 36 million light-years away in the Leo constellation. 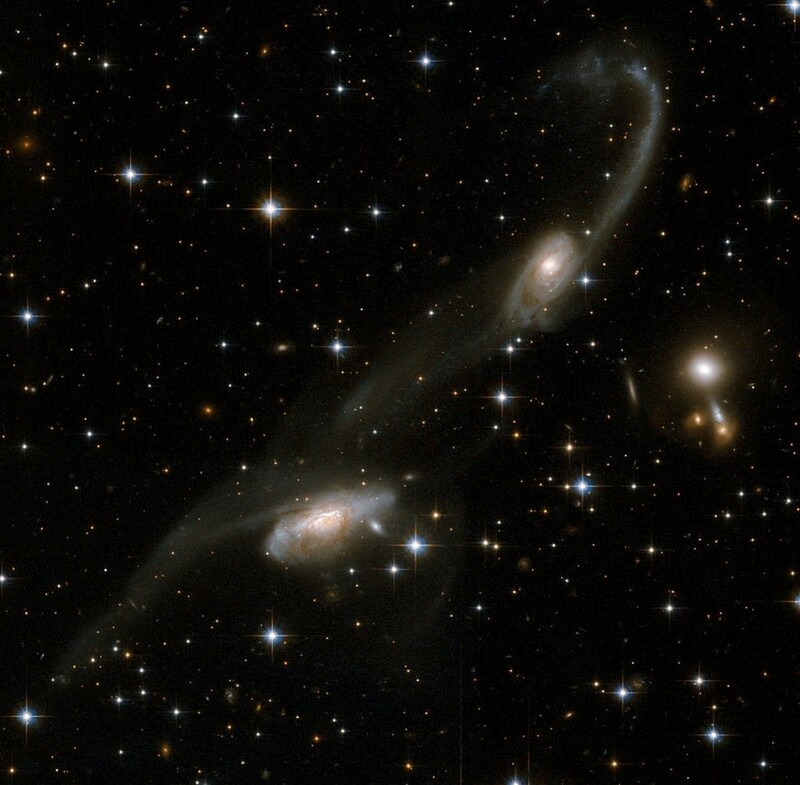 It is the largest member of the Leo Triplet, a group of three interacting galaxies that include Messier 65 and NGC 3628. Messier 66 has a well developed but not well defined central bulge. Its core and bar-like structure illustrates a concentration of older stars, and while the bar seems devoid of star formation, the bar ends are actively forming stars. The prominent and unusual asymmetric spiral arms, laced with striking dust lanes and bright star clusters, are somewhat distorted. They seem to climb above the galaxy’s main disc and an apparently displaced nucleus. This asymmetry is unusual; most often, dense waves of gas, dust and newly born stars wind about the galaxy’s centre in a symmetric way. Astronomers believe that Messier 66′s once orderly shape has most likely been distorted by the gravitational pull of its two neighbours. Four supernovae have been observed in Messier 66: 1973R, 1989B, 1997bs and 2009hd. The Jewel Box (also known as NGC 4755, Herschel’s Jewel Box, the Kappa Crucis Cluster and Caldwell 94) is an open cluster about 20 light-years across. It contains over 100 stars and is located 6,440 light-years away in the southern constellation of Crux. 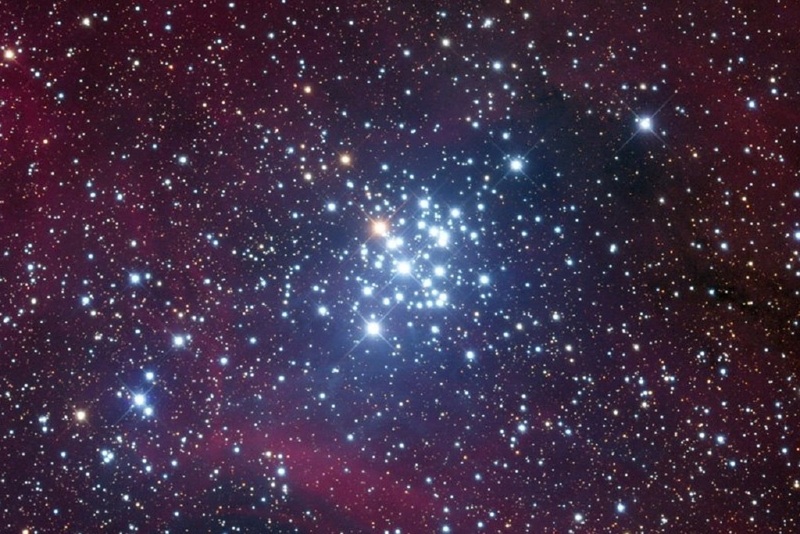 The cluster is one of the youngest known, with an estimated age of only 14 million years. This group of young bright stars was named the Jewel Box from its description by Sir John Herschel as “a casket of variously coloured precious stones,” which refers to its appearance in the telescope. The brightest stars in the Jewel Box cluster are supergiants, and include some of the brightest stars in our Milky Way, like the supergiant star Kappa Crucis, from which the cluster takes its name. This is a very luminous young star in its red supergiant stage, meaning that the star is at the end of its life. This bright orange star contrasts strongly against its predominantly blue, very hot companions. These bright blue stars are indicating that this is an incredibly young cluster, full of short-lived stars that haven’t run out of fuel yet, some of which will go supernova during the next few million years. The Jewel Box is not as bright as one may think because some of the cluster’s light is obscured by the Coalsack Nebula. Open clusters are younger, contain few stars, and contain a much higher fraction of blue stars than do globular clusters. Stars in an open cluster make excellent laboratories in the study of the evolution of stars. Born at the same time and from the same stellar gas cloud, they all move in the same direction. Although they may have different masses, they have the same “star DNA”. Little Ghost Nebula (NGC 6369) is a relatively faint planetary nebula about a light-year across, located over 2,000 light-years away in the Ophiuchus constellation. This image composed from Hubble Space Telescope data reveals remarkable details of the ejection process, including a huge, symmetric, curling outer halo about twice as big as the inner ring, that are not visible from ground-based telescopes because of the blurring produced by the Earth’s atmosphere. These fainter wisps of gas outside the main body of the nebula, were lost from the star at the beginning of the ejection process. Although the nebula is roughly circular, the central white dwarf star appears slightly off-center, and is on the side away from the brightest part of the nebula. The star radiates strongly at ultraviolet wavelengths and powers the expanding nebula’s glow. The glow from ionized oxygen, hydrogen, and nitrogen atoms are colored blue, green, and red respectively. The Little Ghost Nebula offers a glimpse of the fate of our Sun, which should produce its own planetary nebula about 5 billion years from now. The gas will expand away from the Sun at about 15 miles per second, dissipating into interstellar space after some 10,000 years. After that, the remnant stellar ember in the center will gradually cool off for billions of years as a tiny white dwarf star, and eventually wink out. 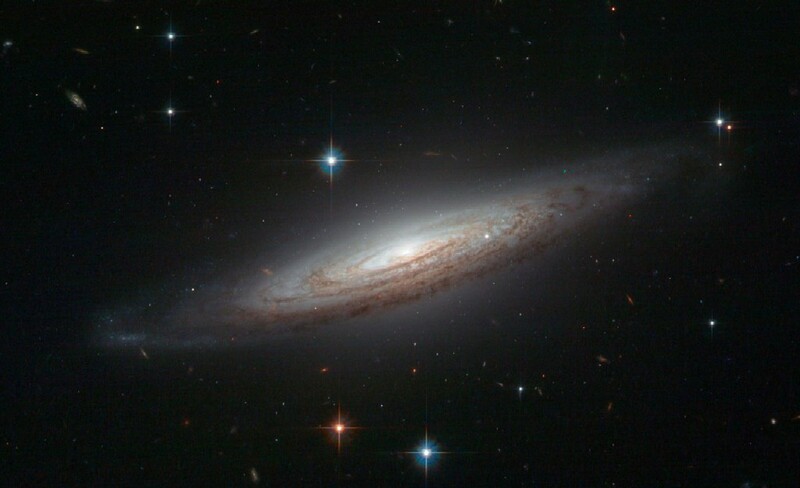 NGC 634 (also known as UGC 1164) is a nearly edge-on spiral galaxy about 120,000 light years across, located some 250 million light-years away in the Triangulum constellation. The fine detail and exceptionally perfect spiral structure of the galaxy make it hard to believe that this is a real observation and not an artist’s impression. The disk of the galaxy is ribboned with dark dust lanes, huge clouds of complex organic molecules expelled by stars being born and stars dying. A striking feature is the asymmetry of the lanes: they are darker on the bottom than at the top. Astronomers have no good explanation for this asymmetry yet. In 2008 this galaxy became a prime target for observations thanks to the violent demise of a white dwarf star. The type Ia supernova known as SN2008a was spotted in NGC 634 and briefly rivalled the brilliance of its entire host galaxy but, despite the energy of the explosion, it can no longer be seen this image, which was taken around a year and a half later. White dwarfs are thought to be the endpoint of evolution for stars between 0.07 to 8 solar masses, which equates to 97% of the stars in the Milky Way. However, there are exceptions to the rule; in a binary system it is possible for a white dwarf to accrete material from the companion star and gradually put on weight. Eventually the star can grow too full –when it exceeds 1.38 solar masses – and nuclear reactions will ignite, that produce enormous amounts of energy, and the star explodes as a type Ia supernova. Other, far more distant galaxies can be seen in the background as well as right through the galaxy in this Hubble image. 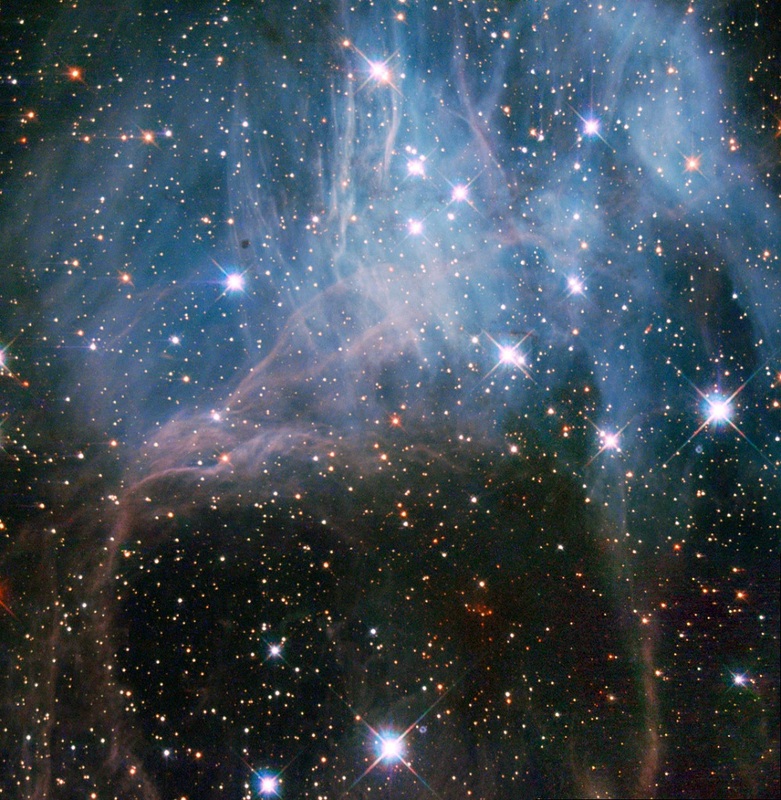 NGC 2040 (also known as LH 88 and ESO 56-EN164) is an open star cluster with nebulosity, located about 160,000 light years away in the Large Magellanic Cloud (LMC), toward the constellation of Dorado. These bright stars of this young stellar grouping, shining through what looks like a haze in the night sky, are part of the largest known star formation regions of the Large Magellanic Cloud, a dwarf satellite galaxy of, and about 100 times smaller than our Milky Way. It is essentially a very loose star cluster whose stars have a common origin and are drifting together through space. There are three different types of stellar associations defined by their stellar properties. NGC 2040 is an OB association, a grouping that usually contains 10–100 stars of type O and B — these are high-mass stars that have short but brilliant lives. It is thought that most of the stars in the Milky Way were born in OB associations. There are several such groupings of stars in the LMC. Just like the others, LH 88 consists of several high-mass young stars in a large nebula of partially ionised hydrogen gas, and lies in what is known to be a supergiant shell of gas called LMC 4. Over a period of several million years, thousands of stars may form in these supergiant shells, which are the largest interstellar structures in galaxies. The shells themselves are believed to have been created by strong stellar winds and clustered supernova explosions of massive stars that blow away surrounding dust and gas, and in turn trigger further episodes of star formation. 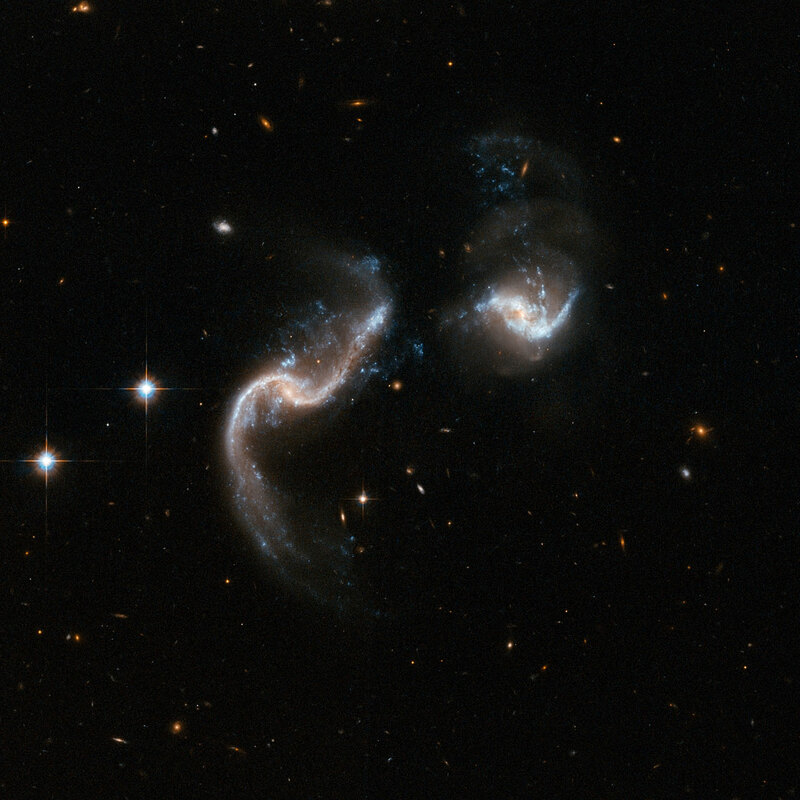 Arp 256 is a system of two barred spiral galaxies in the early stages of colliding and merging, located about 350 million light-years away at the western end of the constellation of Cetus. The system is a luminous infrared system radiating more than a hundred billion times the luminosity of our Sun. Despite the large separation of the galaxies’ nuclei, the two galaxies are strongly disrupted. The strong interaction between the galaxies is responsible for an astonishing number of blue knots of star formation. The galaxy on the right (MCG-02-01-052) consists possibly of two overlapping galaxies, and the large galaxy to the left (MCG-02-01-051) has two very notable extended ribbon-like tidal tails of gas, dust and stars. Some of these super hot blue stars may really not be related to the galaxy itself. It is the 256th galaxy in Arp’s Atlas of Peculiar Galaxies, which is a catalog of 338 peculiar galaxies produced by Halton Arp. 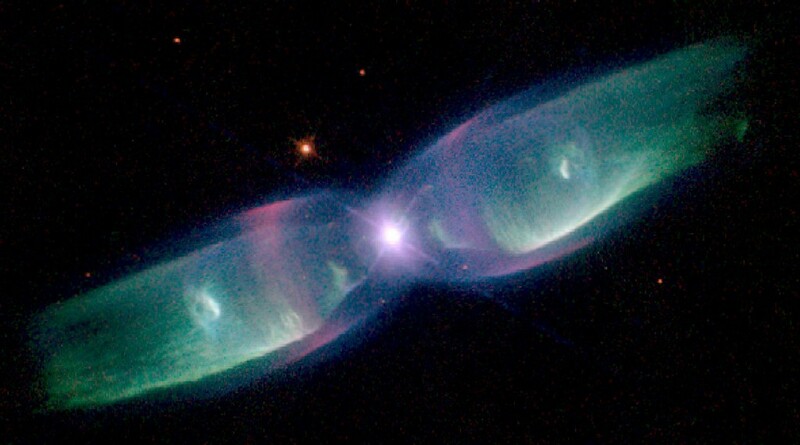 Minkowski 2-9 (M2-9, the Twin Jet Nebula, Minkowski’s Butterfly, Wings of a Butterfly Nebula or just Butterfly Nebula) is a bipolar planetary nebula some 1.4 light-years across, located about 2,100 light-years away in the constellation Ophiuchus. Objects such as M2-9 are called planetary nebulae due to a mistake made by early astronomers who discovered these objects while sweeping the sky with small telescopes. Many of these nebulae have the color, shape and size of Uranus and Neptune, so they were dubbed planetary nebulae. The name persists despite the fact that these nebulae are now known to be distant clouds of material that are shed by stars about the size of our sun undergoing upheavals during their final life stages. Although the M2-9 nebular material is flowing out from a spherical star, it is extended in one dimension, appearing as the wings of a butterfly or hourglass. Planetary nebulae with such shapes are created when a red giant blew away the outer layers at over 300 kilometers per second, and the disk deflected the materials in two directions. Astronomers have dubbed this object as the Twin Jet Nebula because of the polar jets believed to cause the shape of the lobes. M2-9 represents the spectacular “last gasp” of a binary star system at the nebula’s center that orbit each other inside a gaseous disk just 10 times the orbit of Pluto about once every 120 years. The primary component of this binary is the hot core of a Sun-like star that reached the end of its life. It ejected most of its outer layers and became a red giant, and is now contracting into a white dwarf. The second, smaller star of the binary orbits may have been engulfed by the other’s expanding stellar atmosphere with the resulting interaction, creating the nebula. Astronomers theorize that the gravity of one star pulls some of the gas from the surface of the other and flings it into a thin, dense disk extending into space. Such a disk can successfully account for the jet-exhaust-like appearance of M2-9. Minkowski 2-9 has inflated dramatically due to a fast stellar wind, blowing out into the surrounding disk and inflating the large, wispy hourglass-shaped wings perpendicular to the disk, producing the butterfly appearance. The outer shell is estimated to be about 1,200 years old, and will fade gradually over thousand of years. Olympus Mons is a large volcanic mountain on the planet Mars. It is about 600 km (370 mi) wide and has a height of nearly 22 km (14 mi), what makes it the tallest mountain on any planet in the Solar System, higher than three Mount Everests and spanning the width of the entire Hawaiian island chain. It is also the youngest of the large volcanoes on Mars. 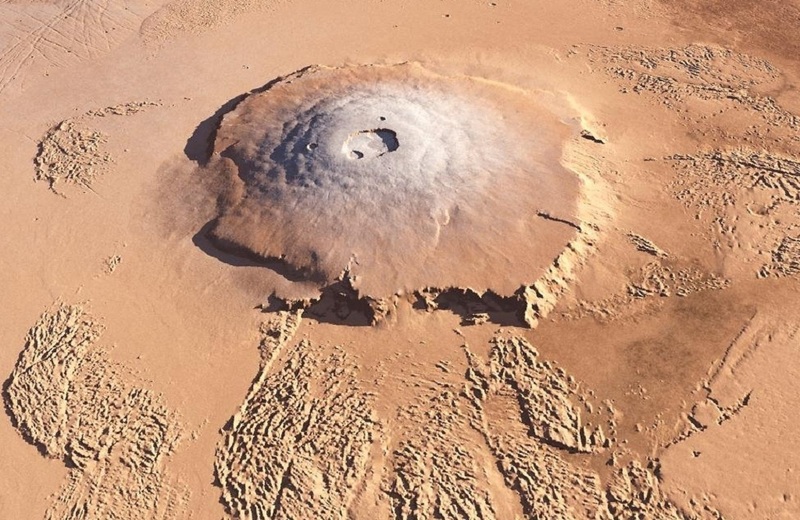 Olympus Mons is located at the northwestern edge of the Tharsis region, about 1200 km from the other three large Martian shield volcanoes, collectively called the Tharsis Montes (Arsia Mons, Pavonis Mons, and Ascraeus Mons). The extraordinary size of Olympus Mons is likely because Mars lacks mobile tectonic plates. Unlike on Earth, the crust of Mars remains fixed over a stationary hotspot, and a volcano can continue to discharge lava until it reaches an enormous height. The shape of Olympus Mons is distinctly asymmetrical. Its flanks, with shallow slopes, are made up of innumerable lava flows and lava channels. They are shallower and extend out further from the summit in the northwestern direction than they do to the southeast. Crater counts indicate that lava flows on the northwestern flank of Olympus Mons range in age from 115 million years to only 2 million years old, suggesting that the mountain may still be volcanically active, though in a very quiescent and episodic fashion. Olympus Mons is a shield volcano, similar to the large volcanoes making up the Hawaiian Islands. The summit caldera (central depression) is 60 × 80 km (37 × 50 mi) across and up to 3.2 km (2.0 mi) deep, probably formed from recurrent collapse following drainage of magma resulting from flank eruptions. It is a composite of as many as seven roughly circular collapse depressions, which are the reflections of the size of the underlying magma chambers. The volcano is surrounded by a well-defined scarp, up to 8 km (5.0 mi) tall, a feature unique among the shield volcanoes of Mars. Lava flows drape over the scarp in places. Also, there are two distinct impact craters on Olympus Mons that have been named; the 15.6 km (10 mi)-diameter Karzok crater and the 10.4 km (6 mi)-diameter Pangboche crater. A wide, annular depression or moat about 2 km (1 mi) deep surrounds the base of Olympus Mons and is thought to be due to the volcano’s immense weight pressing down on the Martian crust. The depth of this depression is greater on the northwest side of the mountain than on the southeast side. Much of the plains surrounding the volcano are covered by the ridged and grooved ‘aureole’ of Olympus Mons. The origin of the aureole is controversial, but they are likely formed by huge landslides or gravity-driven thrust sheets that sloughed off the edges of the Olympus Mons shield. The Fireworks Galaxy (also known as NGC 6946, Arp 29, and Caldwell 12) is an intermediate spiral galaxy (in between a barred spiral galaxy and an unbarred spiral galaxy) about 40,000 light-years across. It is located just 10 million light-years away, on the border between the constellations Cepheus and Cygnus. The center of NGC 6946 is home to a nuclear starburst, and picturesque dark dust is seen lacing the disk. From the core outward, the galaxy’s colors change from the yellowish light of old stars in the center to young blue star clusters and reddish star forming regions, which are actively forming new stars, along the loose, fragmented spiral arms. It is reddened by interstellar dust in our Milky Way because it lies almost in the galactic plane. Most normally, bursts of star formation happen in galaxies which have nearby companions to lend materials. Yet, NGC 6946 appears to be alone, although two dwarf galaxies are associated with NGC 6946. But these companions are so small and distant from NGC 6946 that they have minimal effect on the main galaxy. NGC 6946 is also bright in infrared light and rich in gas and dust, exhibiting a high star birth and death rate. In fact, nine supernovae (SN 1917A, SN 1939C, SN 1948B, SN 1968D, SN 1969P, SN 1980K, SN 2002hh, SN 2004et, and SN 2008S) have been observed in NGC 6946 over the last 100 years. With this number of supernovae, NGC 6946 is leading the statistics, just one SN more than follow-up Messier 83.